Phishing is not a new threat. Attackers have used phishing for decades, and enterprises have attempted to stop phishing attacks with technology since the beginning. Email security appliances, email authentication services, email and URL filtering services, file and URL sandboxing... just to name a few. Yet even with these technologies in place, phishing emails still make it into user inboxes where they trick users into divulging sensitive information, transferring funds, or executing malicious payloads. In fact, the initial compromise in most breaches today – particularly those that make news headlines – is often traced back to a phishing attack initiated by the click of an email. In this white paper we will dive in to the fifteen best practices that will transform an enterprise's users into security assets, working in conjunction with the overall security program to attain an unprecedented level of protection against phishing atacks. The four essential steps involved in achieving a new vision of enterprise phishing protection forming a cycle that bridges the gaps between users, tools, and operations in a way that maximizes each in a unified program. 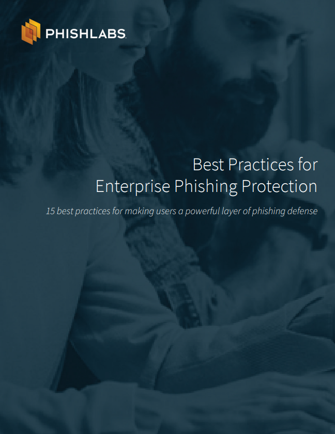 The fifteen best practices that will transform an enterprise's users into security assets, working in conjunction with the overall security program to attain an unprecedented level of protection against phishing attacks. Fill out the form to the right to download the white paper.